Julius Benedict (1804-1855): La Capinera. Enrique Granados (1867-1916): La Maja y el Ruiseñor. Franz Schubert (1797-1828): An die Nachtigall.Edvard Grieg (1843-1907): Die verschwiegene Nachtigal. Johannes Brahms (1833-1897): Nachtigal. Louis Beydts (1895-1953): La colombe poignardée. Le petit pigeon bleu. L´oiseau bleu. Le petit serin en cage. Darius Milhaud (1892-1974): Tais-tois, babillarde. Félicien David (1810-1876): Charmant Oiseau. Reynaldo Hahn (1874-1947): Le Rossignol des lilas. Camile Saint-Saëns (1835-1921): Le Rossignol. Reyngol´d Glier (1875-1956): With Sweet Emotion the Little Nightingale Sang. Aleksandr Alabieff (1787-1851): The Russian Nightingale. Nikolay Rimsky-Korsakov (1844-1908): The Rose Captives the Nightingale. 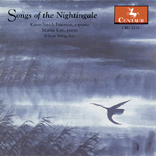 Benjamin Britten (1913-1976): The Nightingale and the Rose. Ned Rorem (b. 1923): The Silver Swan. John Duke (1899-1984): The Bird. Edward Horsman (1873-1918): The Bird of the Wilderness. Stephen Sondheim (b. 1930): Green Finch and Linnet Bird. Victor Herbert (1859-1924): The Nightingale and the star.